Please be careful when performing the factory reset because it will erase your internal storage. You need backup all your data in the internal storage, including your contacts and messages. Apps can be re-installed, but the settings will be gone. If you have rooted your phone, you can use Titanium Backup to backup and restore almost everything. If your phone is not rooted, you may try Carbon to backup and restore your apps. You may check this tutorial on how to use this app. Of Course it is a good idea to use Kies to backup all supported items (contacts, messages, s notes, photos…) to your PC. After resetting, you can restore the backup. But you should never rely on Samsung’s Device backup. It is not reliable based on my personal usage. Sometimes, the slowness is due to insufficient available RAM. Yes, I just said our Galaxy Note has sufficient RAM (1GB) for Jelly Bean. Even you add up all Samsung’s TouchWiz, and all bloatware from Samsung and from your local carriers, the 1GB RAM (800-900MB accessible) should be able to handle all apps easily. So, why is there this insufficient RAM issue? As discussed in Why did I get less free RAM after the ICS update in my Galaxy Note? Android is very efficient in memory management. The RAM in our Note has 4 portions: reserved, used, cached, and available. Reserved part is for system devices, e.g., GPU, in this Jelly Bean update, it is about 130-140MB. So, about 860MB is available for Android, and all stacks over it. Among this 860MB, Jelly Bean actually only require less than 200MB, slightly more than Ice Cream Sandwich. The TouchWiz UI (aka Samsung’s skin) is over-bloated, and needs about 200MB. This implies users get more than 400MB for their apps. This is more than enough for any app in the Play Store. But in our Galaxy Note, there are some bundled apps (bloatware) from Samsung and local carriers, e.g, Yahoo Finance, Learning Hub, always running because these apps mark themselves as essential (it will restart itself if you kill them use task manager), although they are not essential. An app can also listen to reboot or start services, and therefore launches itself when you reboot your phone. So, immediately after you reboot your Galaxy Note, if your Note uses more than 600MB RAM, you may have RAM issue with apps. Your Note may be sluggish gradually. You can read the RAM info in any task manger or through Application Manager–running. If this happens, it simply means you have too many apps either marking them as essential (usually bundled ones) or trying to auto-restart themselves. You should check the RAM before using any other apps except task manager. Only check this immediately after rebooting. disabling some unnecessary bundled apps (of course, if your Note was rooted, you can uninstall them). You should be very careful and only disable the apps that you are not going to use. This can be done in Application Manager–all. For each apps, you can choose disable. If there are updates installed, you need uninstall the update first, then to disable. preventing some apps to start automatically. You can go to Application Manager–downloaded. For each app, you can choose “force stop” if it is not grayed out. During the Jelly Bean update process, the updater actually marked all old apps to start automatically! This was done in the optimizing apps stage in the updating process. Force stop may be not consistent (depending on app). So, a more powerful approach is to use some autorun manager. For non-rooted phones, you may try an app called Autorun Manager (in basic mode). Step 1: Back up all important data in the internal storage. You may use Kies for some files, contacts, S Notes, messages, photos, and Carbon for app settings. Make sure the backup is in a safe place. Step 4: Reboot and monitor the RAM usage. The used RAM immediately after reboot should be less than 600MB. Step 6: Re-install apps one by one from Play Store. Step 10: Reboot and check. 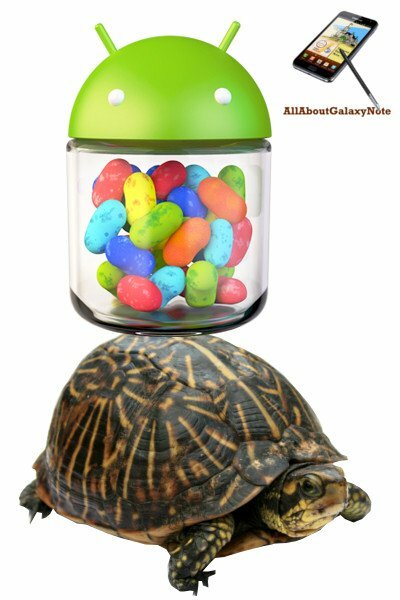 Is the slowness problem in your Galaxy Note solved? If not, post your questions in the comments box below of discuss it with other Galaxy Note owners in Galaxy Note discussion forum. Good news! I haven’t received the new battery yet, but for the “lagginess” subject, definitively the factory reset solved the mater. Anyone experiencing the same problems should do a factory reset without a second though. Thank you for the update and sharing the solution. Yes, it is recommended to reset the phone after a major update. You may also reboot the phone into recovery mode and clear the cache partition to clean the reset of leftovers. Actually, if you can fork a bit more, Note 2 performs far better (2GB ram really makes the difference; partition layout is more modern). Hi guys, little late post, but I had my old Motorola Razr D3 broken and I bought this Galaxy Note N7000 from a friend. It came with GB and as I am used to JB, I upgraded it through kies. It became simply unusable: laggy, hot and very fast on draining battery. With 100% charge it took 15 min to reboot when I was restoring the apps I used to have on the old phone. I am doing the factory reset now, and I have already bought a new original battery. I will post again in one or two weeks, as soon I can have a formed opinion. I wanted to ask tht can ve update our galaxy note to android 4.4.2? ?i know tht samsung has not released it..but can we do it by flashing?? Samsung will not release the kitkat update for the original Galaxy Note. Note 2 will get the update this year, maybe in a few months. If you use any other unofficial roms, you will very likely lose s pen related functions. you can try to use the task manager widget to clear memory. Then try again. It should not have any issues to upload photos to facebook. I deleted it accidentally once before, there is no impact on the old Note. U WILL HAVE MAXIMUM RAM AND FASTEST ROM EVER…..ANY QUESTIONS…….?????? Hi i am using Samsung Galaxy Note 1 from may 2012. Last 3 months i am using jelly bean. Last two days i am unable to charge my mobile. when ever i am connecting the device to charger it shows that device is charging, but it’s actually not. Same happening while connecting to PC via USB cable. Please advise is the problem is due to charger or charging pin in the mobile device or battery or the jelly bean software. Make sure you are using a charger with 1000mA or similar current, if it is not the original one. If you used the phone heavily (charge once or more each day), you probably can consider to get a new battery. It is unlikely caused by the software. But you can always try to reboot and try again. really? I mean REALLY??? This is obviously an update fault and I’ve been struggling for days now. i want to ask one more thing.. why people complaining too many problems on ICS too after updating frm GB..
best solution for note N7000, after upgrade to 4.1.2. Had my phone 2 years, fantastic, best phone i ever had. After upgrade, phone lasts about 5 hours, no good for work as battery runs out. Calls drop out, some times disconects before it connects, can take minutes to try and place a call, when its bad i give up. App selection, select g-mail and get lottery, or e-bay, useless. Note, what a complete waste of time this is now, used it all night before as a note pad, now takes minutes to even start, or just freeze, or nothing happens. The best fix i found along with two fellow workers, throw in nearest bin and buy a Nokia lumia. At least this works. Given up with Samsung phones now. Unless anybody knows how to downgrade to ICS without having to be a professor in IT. i just sold my Galaxy Grand Duos. i am planning to buy Note N7000 as it is in my budget.. should i go for it? is it worth to get it in place of Grand? will it run slow on latest JB? For JB, it is not as smooth as GB in Galaxy Note. But it is still usable. Based on product cycle, probably it is not a good idea to get the N7000 now. In most regions, the price of Note 2 is already decreasing.If budget allows, get a Note 2. The bottom line is to get a phone with more than 1.5 ram, so it will not be obsoleted in next 2 years. Anyway, it is up to your budget and preferences. From my end I would tell u nt to buy note. Its vompletely outdated, from my suggestion wait fr another 2 months or so ull get s3 in this price. till nw it is working great..
right now it is running on 4.0.4 nd showing an available update.. should i go for it or not??? as it is so smoothly working till now.. should i update d OS? Maybe not as smooth as ICS. But it is acceptable for most users. You get some nice features, especially Google Now. I have been using galaxy note since November 2012.Earlier there was no problem .But now adays, my mobile charger is disconnected automatically with a tone although my charger and cable is ok. sometimes mobile shows message like” Dock is connected” for a second and charging gets disconnected.Then I brought it to my nearest samsung service center. They completely updated my mobile and the problem was solved.But after few days, i faced the same problem as soon as i downloaded some applications from play store and also i used PAN drive via cable.But my charger is working randomly at present.I do know what is the actual reason.is there any problem because of downloaded application?? Downloading was done via WiFi connection.So, Plz kindly give me a solution.thank you. There is a base problem in all galaxy note manufactured, the charging unit needs to get replaced, go to the service centre they will change the charging unit, tell them that you phone has auto charging problem, i have already replaced it twice free of cost as my phone was under warranty. Hopefully the same problem is with yours. A good advice for all the galaxy note owners please try to sell of your phone asap cause samsung has slashed the prices to hell, right now in india galaxy note 1 is availaible at 22000 only, via online websites like flipkart and so on. I have received small software update (2.5 MB) yesterday for galaxy note 1 N7000 , I already updated 4.1.2 earlier in the year , they said that this software update is for better stability , any one know any thing about that ? It is probably for some bug fixes specially for your region. It is recommended to apply such updates. Does anyone know when the official JB will be released for Galaxy Note in Sweden? The customer service seems to be very reluctant in predicting any date. Another question is, my galaxy note was purchased in Sweden but since I’m in India now, is there a way to get the official updates for India, instead of the Swedish ones? The update is based on the origin of the phone. You have to wait for the update for Sweden although you are in India now. I hope that on 4.2.2 update Samsung will solve this ram problem…btw can u tell me when this update will be coming…..
mine is doing well with jb..
great article..I’m gonna try your steps on my note and let u know if there is any improvement..
You can also try to limit the background processes to 2 or 3.
even after that it gets back to using over 700 MB ram in a few minutes..
can you please tell me one thing…new phone which comes with jelly bean pre installed… have free space of 350mb to 370mb…how is that possible? i can give you ex, Samsung Grand, karbonn titanium s5, samsung s2 plus all these phone has a free space of 370mb…..why is our phone shows only 80mb which has been installed by kies…. I have done this before but its not working. you may try to disable power saving, which sometimes may cause the slowness. yes, i did factory reset, i have already disabled some 15 applications it is still showing 75MB free… Samsung/android..need to send the update to resolve this problem or need to send the update to degrade to ICS through kies. The best way to test the ram is to the RAM immediately after rebooting your phone. The memory issue can be caused by some apps. You can also try to limit the background processes to 2 or 3. To downgrade, you can go to local Samsung service centre to flash it. Hi, i see in galaxy grand the RAM free space is 250-260MB Grand also run on jelly bean. how come Grand has so much free space? and in my note it is 80MB, is it coz of company update software? i went and checked with samsung service center they asked me to reinstall the software again with them, is that means kies download has problem or i’m not sure even after i install the jelly bean from samsung service center will i fase the same problem? Did you try factory reset after updating? You may try to disable some unnecessary apps, disable some auto-start apps. I see lot of google map processes in partial wakelocks in BBS… How do i tackle it. Go to settings–developer options–Limit background processes. You can try to change it from standard to 2 or 3. Glad to know. Please note, if you reboot your phone, you have to apply the setting again. Hi Sanjay, it is very likely caused by some of the apps. After factory reset, if you do not install any apps, how is the ram and speed? you can test it for a few hours. You probably can also disable some bundled apps that you never use (Under Settings–Application manager–All). Occasionally, it is cased by background process, you can try to limit the background process to 2 (under Settings–Developer options–limit background processes; it will be reset to default after reboot) to see whether they are any improvement. You may also try this memory usage app to check who is using the ram. I had same problems after upgrade to 4.1.2. Battery was draining like crazy. Its hardly provide back up morethan 5 hours. I regret for upgrading my note and want rollback to gingerbread. But fortunately after using method to drain battery to zero and then charge it to 100. Do this for weektime & battery back on its previous stage. Now I get same battery backup as when I had on gingerbread. my suggestion to all that please bear the draining problem to couple of days then using given methods patiently solve problem in week time. Mark my word..
Manoj, thank you for sharing your experience. Yes, re-calibrating battery is needed after the update. Actually, this should be done at least once a month. Also, please also avoiud charging thorough USB ports in laptop or old chargers which usually output less than 500mA current. Try to use the original charger or charger with a rated output current around 1000mA. I upgraded my note to 4.1.2 and it has started heating up. battery drains very fast. It was working well for last more than a year before this upgrade. The first thing you may try is to do a factory reset, which can solve a lot of problems related to upgrade. Also, the battery need re-calibrate after upgrading. So, it is a good practice to remove the battery at least once after upgrade. You also try to discharge battery to close to 5%. then charge it all the way to 100% for at least once each month.